Ukraine's Prosecutor General's Office (PGO) has said its request to the Verkhovna Rada for removing immunity from prosecution from deputy Yaroslav Dubnevych (Petro Poroshenko’s Bloc faction) requires more evidence. "The request to give consent to criminal liability for Dubnevych requires substantially more evidence, which should unquestionably confirm the conclusions made by the investigation," PGO spokeswoman Larisa Sarhan said on Twitter on January 14. 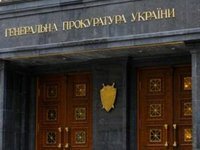 Sarhan later on Facebook said the request prepared by agents from the Special Anti-corruption Prosecutor's Office (SAPO) under Part 3 of Article 27 and Part 5 of Article 191 of Ukraine's Criminal Code (misappropriation, embezzlement of property or taking possession of it by abuse of official position) showed that it does not fully comply with parliament's requirements and some allegations have not been proven. "The PGO proposes that SAPO finalize the text of the submission with the aim of eliminating a number of shortcomings, supporting it with relevant evidence and correcting allegations that do not comply with the law. After eliminating the shortcomings, the submission will be signed by the Prosecutor General and sent back to the Verkhovna Rada," Sarhan said. As earlier reported, on December 31, 2018, the Kyiv-based Ukrainskaya Pravda ezine, a PGO source, said SAPO head Nazar Kholodnytsky had prepared for Prosecutor General Yuriy Lutsenko a request for parliament to remove Dubnevych's immunity from prosecution.